A high protein calf milk replacer formulated to provide advanced nutrition for fast growing heifers. 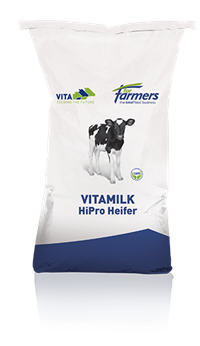 VITAMILK HiPro Heifer offers a balanced, highly digestible fat and high protein level to avoid digestive problems. This ensures the calf has a plentiful supply of energy for survival and protein for framed development.